Oliseh Wins Best Coach Award In Dutch Second Division – Royal Times of Nigeria. 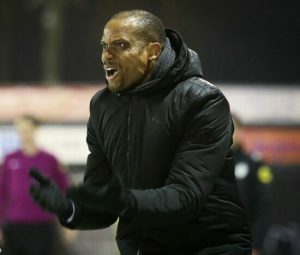 Former Nigeria international and Fortuna Sittard coach Sunday Oliseh has been voted the best coach in the first half of the Dutch second division this season. Fortuna Sittard confirmed it in their verified Twitter handle. After taking over as coach of Fortuna last season, Oliseh helped the club to escape relegation. This season, Oliseh led Fortuna to a club record eight consecutive home victory. He recorded his highest away win as a coach with a 6-0 victory against Telstar in September. Also, he got Fortuna into the third round of the Dutch Cup for the first time in 18 years following a 3-0 win against Go Ahead Eagles in October. Fortuna Sittard are currently third in the second division.